From the director of Summer Wars and The Girl Who Leapt Through Timecomes Wolf Children, which is now my favourite anime film to date. A word to those with an easily touched heart: This film is emotional. I cried more than once while watching Wolf Children and I don’t regret it. Hana is a young college student. One day she notices a particular man in her lectures. He doesn’t hand in work or have a text book. She goes after him and finds out he isn’t officially part of her class. He just wants to learn. The man works in removals by day. He goes into people’s homes and drops off their boxes and as he does so he dreams about what it would be like to have a home of his own, a dream that Hana finds touching and would love to be a part of. The pair fall in love and when the man reveals his secret their bond is only strengthened further. 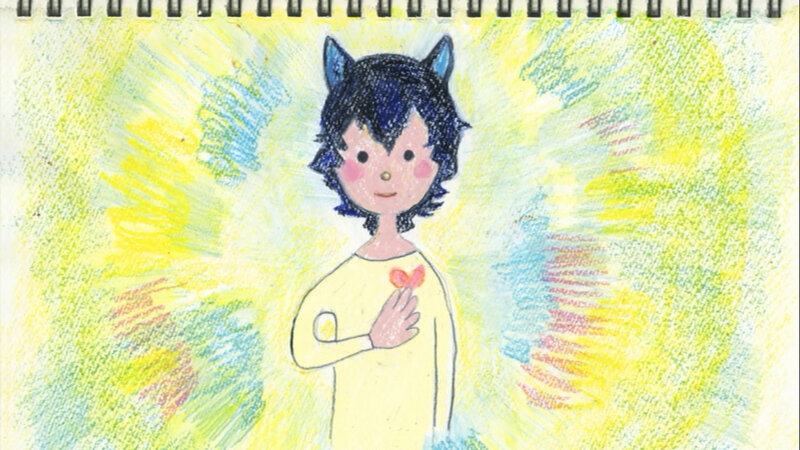 He is a Wolfman who can change into a wolf at will, a fact that complicates matters surrounding their children, Ami and Yuki, who are also born with this amazing ability. The Wolfman and Hana’s tender love story is soon touched by tragedy. But despite aspects of her world crumbling, Hana manages to show tremendous strength. In the face of adversity she tries her hardest to look after her wolfchildren and keep them safe. She’s constantly trying to keep their secret hidden and do all the research she can in order to take care of her children in the right way. Hana is a beautiful choice of protagonist. She never gets truly angry at her children for being who they are, instead she goes out of her way to show she accepts them. As the years go on it becomes hard for her to imagine letting them go because she feels like there is always something she hasn’t managed to teach them, some great secret as to how to live a great life, that she can’t quite put her finger on. But it is her actions as a dedicated mother that teaches them how to be themselves beyond anything she could ever verbalise. Another beautiful aspect of this film is watching Ami and Yuki grow up and mature into individuals with their own desires. Their paths in life divulge and they don’t always see eye to eye but ultimately they both learn to be who they want to be because their mother allows them to decide if they are people or wolves first. Over the course of their childhood they explore both sides of their nature, thanks to Hana . Ami gains responsibilities he cannot help but honour and Yuki deals with the question of whether being a person first means having to eternally suppress the other half of herself. The wolf aspect of the film adds a supernatural element but that doesn’t make this film any the less accessible and comparable to real life. 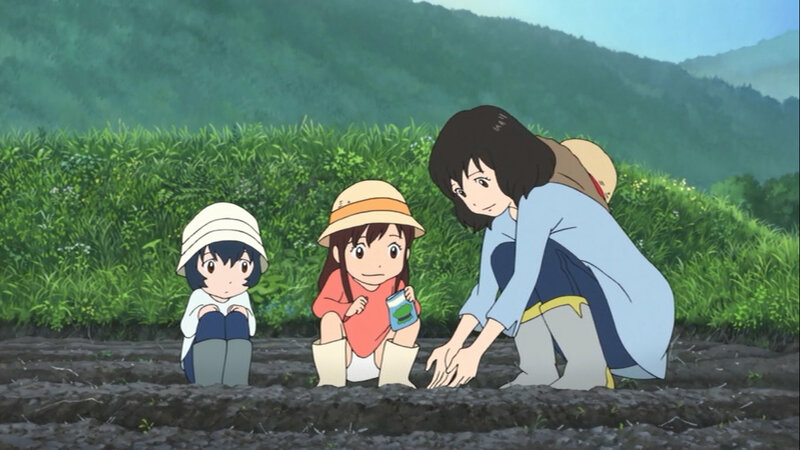 At it’s heart Wolf Children is the story of a mother trying to do the best she can for her children in the face of loss and hardship. Things don’t always go perfectly or smoothly but her dedication wins her the affection of her community and her children, who do have to go their own way but will never forget what she has done for them. 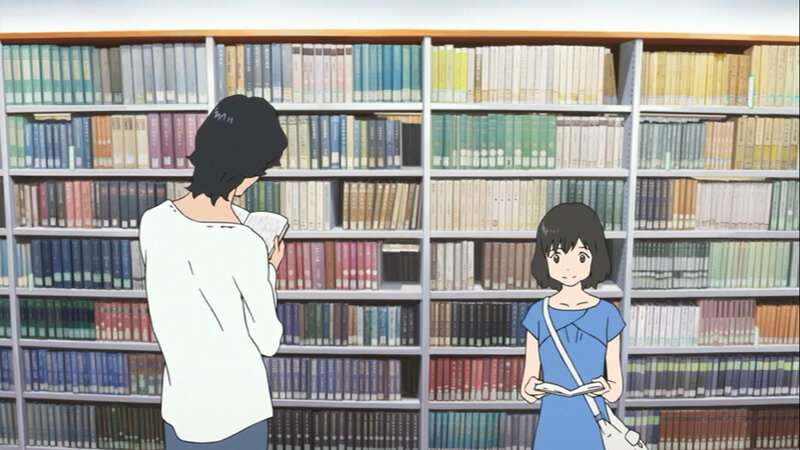 Hana faces heart-breaking situations and has to learn to let go and accept the natural flow of life more than once but she always pulls herself through and stands strong at the end of the day. The visuals in this film are also very beautiful. Scenes such as one where Ami and Yuki change smoothly between forms while racing through snow are a treat to watch. The soundtrack was composed by Takagi Masakatsu and the tracks are often wistful and sometimes quirky. They always add to the beauty of the scenes they accompany. 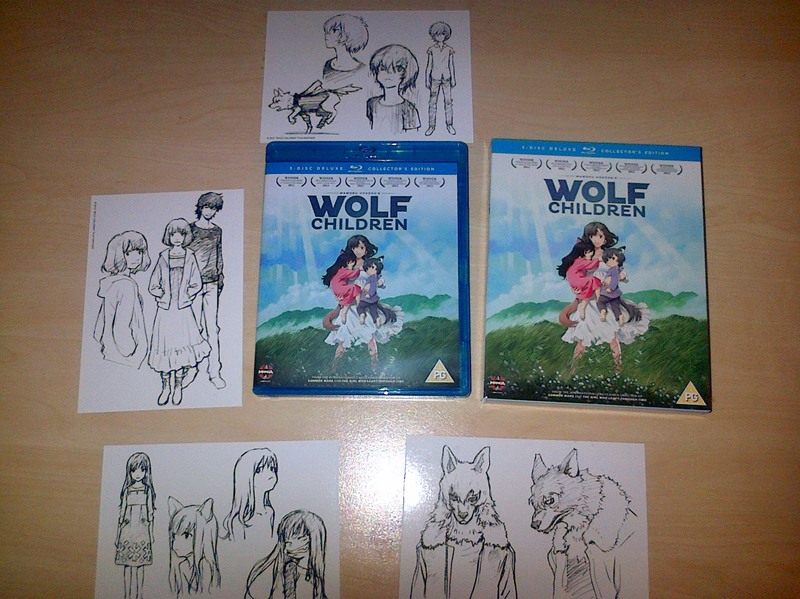 I bought Manga UK’s Collector’s Edition. It includes a blu-ray copy of the film and special features, plus dvd copies of the film and special features on two separate discs. The most exciting part of this collector’s edition is the art cards. There are four art cards featuring hand drawn sketches of the main characters . I really love them and they are a lovely addition to the product.